‘FLIPP’ premiere. Unerhörte Musik, Berlin. Well – a few weeks ago I went along to the premiere at Unerhörte Musik in Berlin, of my new short saxophone duo, Flipp, which I wrote for Christoph Enzel and Adrian Tully. I have to say that the piece was written very quickly, after coming back from a slew of concerts in London just the week before the concert. It pretty much only uses two notes for most of the piece. They played it BRILLIANTLY – and i was pretty happy with the piece. I haven’t put up the info page here for it yet, but there is a recording of this piece here. It works really good with headphones, to get the stereo effects between the two players. (In live performance they stand at opposite sides of the stage.) Check it out. 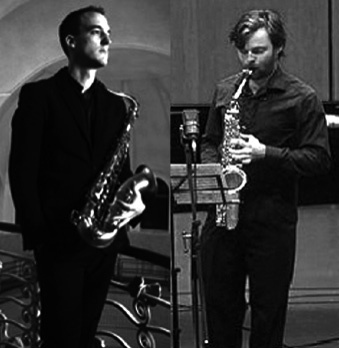 Christoph also played my Metamorphoses after Britten on soprano sax – rather wonderfully too. The acoustic in the BKA Theater in Berlin is as dry as a bone, which affects how resonant and harmonic the slow movements sound, but the fast movements in there sounded punchy and clear and really energetic. I really hope Christoph and i can record them properly sometime, to go alongside the wonderful recording of Melinda Maxwell playing the oboe version of the pieces. Anyway – I look forward to working with these two amazing players again soon!